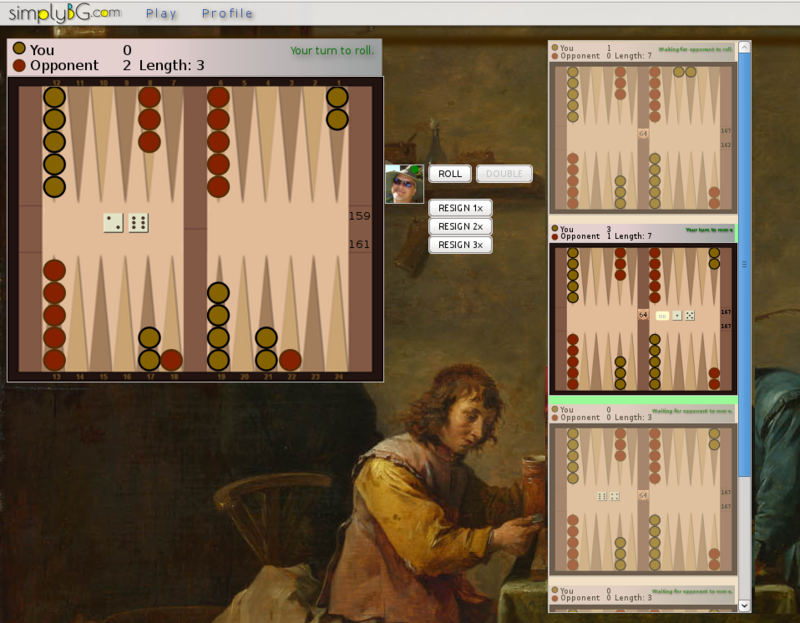 Below are some of the backgammon match and tournament play features at SimplyBG.com. Players at SimplyBG.com are serious players of the game, that are committed to maintaining a superb play environment. Experienced and beginner players welcome. Your play is rated and maintained using our rating system that is based on the ELO Rating System. You ELO is calculated and your ELO-history are maintained with your account for each type of match you play, thus multiple ELOs are maintained for your account. At SimplyBG.com, players with 400 or less experiences (games), are considered in your ELO computation. Reference this article, The FIBS Rating System, by Kevin Bastian, section "Player Experience". To ensure trust and intrigity, at SimplyBG.com, we take dice rolls seriously. That's why we use random.org for our dice rolls, where randomness is their business, not ours. Export match and game data to a variety of formats (Snowie,JellyFish,GNU) including import into eXtreme-Gammon ™ or GNU-Backgammon for complete play analysis. Review and replay of finished matches and games, including complete dice rolls and dice statistics. In completed matches, clicking on the dicerolls of the moves will setup the board and pieces in the position of that move. This provides a way to see the board and moves made. Realtime game stats show dice totals, moves made, hit counter, # of doubles, and # of blocks, and complete game play history for the entire match. Ever wonder if your opponent's dice rolls are better or worse? At SimplyBG.com, all dice rolls and accompying moves are shown as you play. Many personal preferences are available; play-board orientation, single-click moves, automatic moves enabler, high-contrast color selections to aid color-blindness settings. Personal avatars may be managed locally or globally using Globally Recognized Avatars, Gravatar.com. Gravar.com is a convenient way to manage your avatar for SimplyBG.com and beyond. Play single and multi-game matches up to 101. Start and finish a match at any time. Unfinished games are maintained on our server so you can take as long as you and your opponent like to play. Leave and return to play unfinished matches on your schedule. Play and maintain multiple, active, games at the same time. Bring your own opponent (BYOO), a unique, tokenized, invitation system that allows for matches to be pre-configured and played at designated times, or times that are convenient for players to meet up. With this, match and tournament play can be organized and managed from start to finish with minimal administration or intervention. Also, the player parlours at SimplyBG, provide impromptu and freelance play opportunities. Setup custom match play with or without the Crawford Rule, and with or without the Doubling Cube. Cube is configured to support double-match-pount rules. For matches associate to tournaments, the US Backgammon Dead-Cube rule is available for use. A variety of play variations is supported, including Longgammon, Nackgammon, Hypergammon. "Match Play" and "Money Play" rules available. For Money-Play matches, double and re-double (also known as a Beaver) rules are supported. As well, the Jacoby Rule is supported for Money Play matches. Solid-state game play manager guarantees player turn and dice roll management, even where network connectivity may be unstable. Play manager is tolerant to connection interruption without loss of game state. The play manager was designed to consider the leanest of computer requirements. We want everyone to be able to play, on any device, old or new. Play board is compatible with desktop and mobile devices. Play anywhere, any time. Absolutely no downloads or installs or plugins required to play. Real-time Watcher system for public matches. Match play may be private or public. Public matches may be watched by anyone else who is a member of SimplyBG.com. The SimplyBG play manager is built on a proprietary framework based on Service Oriented Architecture (SOA) design. Using REST/API, the play manager delivers JSON or XML responses for AJAX style software development. This lightweight framework can be easily deployed in unlimited environments. Please contact if you are interested in becoming a developer of this framework. Player lobbies will be coming to provide impromptu, freelance play. Regularly scheduled 4 to 16 player Round-robin Tournament play in a variety of match definitions. Since its beginnings in 2010, SimplyBG.com has come a long way. SimplyBG is constantly being improved. Below is a list of features coming soon. Timer to monitor per-move and overall time management of a match, intended for tournament play primarily. This feature would follow the US Backgammon Federation (USBGF) standard of total time of 2 minutes per the number of points in the match, plus 12 seconds delay after each turn before the clock starts for opponent. Specific and custom timers will be made available for private clubs, definition of the timer rules governed by the club. The "forgive opponent last-move" feature. We want to play against opponents at their best game. We don't want "software" to be the culprit or outcome of a game, match or tournament. Prior to starting your turn, prior to double challenge or dice roll, you may have your opponent's most recent move undone so that they can redo thier move. In this way, games are played on player backgammon strengths, not computer skills. Automatic dice roll and automatic moves, where forced moves exist, at times of play where no stragetic advantage exists otherwise. Externally loaded dice-rolls of your control. Even though the dice rolls at SimplyBG at certifified by random.org, your matches may be provided a custom source for dice rolls. Regularly scheduled 4, 8 and 16 player Bracket/Elimination Tournament play.